From the tiny hamlet of New Glarus comes the beer that is the de facto king of Wisconsin microbrew, Spotted Cow. There are very few bars in the state that don’t have it on tap. But Daniel Carey, co-founder (with wife, Deb) and head brewer of New Glarus Brewing Company is no one-trick pony. They are continually producing Belgian Red and Raspberry Tart, two of the winningest fruit beers out there. Fat Squirrel and Stone Soup are stellar malty brews, and their Dancing Man Wheat is one of my favorite American wheat beers. They have ceased production on a few of my top picks, including Yokel (“Buy local, drink Yokel”), Uff-da (a rich bock), Hearty Hop (their IPA), and Copper Kettle Weiss (an incredible dunkelweizen, named after the copper kettles Dan brought over from Germany). But Dan really comes into his own when brewing the Unplugged series. These (usually one-time) brews have included some divine sours, imperials, and barrel-aged selections. The Bourbon Barrel Bock has yet to be matched by a bourbon aged beer in my mind (I once said I would be happy just to smell it). Enigma was among the most unique beers I’ve had the opportunity to try, comparable only to Unibroue’s Quelque Chose. Dan is also one of the few brewers around here to attempt a Berliner weisse, a style that is all too easy to seriously butcher. 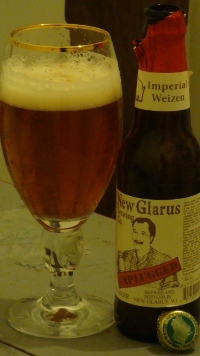 New Glarus beer is only available in Wisconsin. This is absurd considering their position among the largest craft brewers. People in Wisconsin drink a lot of good beer. Hey, leave some for the rest of us! After a brief attempt to expand distribution to Illinois a few years back, they built a new brewery up the hill with a much larger capacity. After a year of operation they still have yet to expand outside their home state, vexing craft beer lovers everywhere. 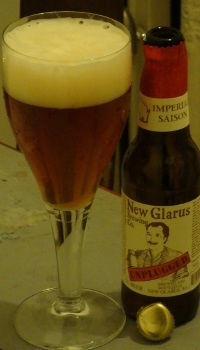 Tonight I have three examples of the work coming out of New Glarus this past year. First up I’ll try their Edel-Pils, brewed last summer. I know, I know, I should have consumed this fresh. Well, I’ve kept it dark and chill so hopefully it hasn’t lost too much. I’ll also have a pair of the Unplugged selections from 2009, the Imperial Saison and the dry-hopped Imperial Weizen. The Edel-Pils pours a crystal clear golden straw. The bone white head is frothy and leaves significant lacing on the glass, though it could last longer. A rich noble hop aroma greets you from a distance. More deliberate investigation yields a delicate malt character and a hint of that Bavarian lager corn character (almost certainly from the yeast. I think Spotted Cow is the only beer they make with corn). The flavor is filled with malt, a clean and rich barley taste with just a bit of sweetness. Balancing bitterness and grassy noble hops round out the flavor. The body is full and creamy at first but gone in an instant. A well executed pilsner. The Imperial Saison is a beautiful opalescent coppery gamboge. The head is creamy, the appearance of clouds, and leaves not just lacing but a coating as it (slowly) falls. This nose is thick with fruit and spice. Apricot, orange, lemon, and apple dance with coriander and black pepper. Some alcohol pungency adds complexity yet refrains from being sharp. A bit of caramel and almond make for a truly intriguing aroma. The first of the taste is a spicy alcohol warming on the tip of the tongue. This is accompanied by a hint of crisp acid and a dustiness to ensure you know it’s a saison. Some fruit comes out, but very different than on the nose. The apricot remains, joined by kiwi and banana. A bit of caramel and clean maltiness round out the flavor. The body is light and refreshing like lemonade. A bit of bitterness and some of the fruit lingers. This beer is quite complicated. I’m glad I have a second bottle to sit on for a while, to see how it ages. Finally, the Imperial Weizen. The color is very close to the saison, a bit more towards copper. Chunks of yeast hang suspended in the beer. They are pushed up by the bubbles evolving in the middle and drift down towards the outside, almost giving the appearance of a lava lamp. The creamy off-white head leaves a great lacing but doesn’t last nearly long enough. The aroma is rich with spices: clove, nutmeg, and cinnamon. Sweet toffee and plenty of wheat come out, too. There is just a bit of higher alcohol that could be perceived as medicinal, but that is probably simply interaction with the spices. The clove, nutmeg, and cinnamon are alive and well in the taste. Here they are joined by a citric hop flavor of grapefruit and orange. Caramel and toffee from the malt also contribute to the character. There is certainly an alcohol warming, and a lively effervescence that threatens sharpness without delivering. Complicated bordering on gridlock. By that I mean, though the flavor is certainly interesting and not at all unpleasant, I wonder if perhaps there is too much competition. To some extent the richness of tastes block each other out. Still quite a good beer. Chuckanut Brewery (Bellingham, Washington), the well-deserved small brewpub of the year, brought home plenty of hardware. Two gold medals were for their Dunkel and Vienna lagers. They also took silvers for their Pilsner and Schwarzbier. Brewing world-class lagers in a brewpub is no easy task, but experienced brewer Will Kemper has proven up to the task. My friend Nate keeps raving about Troegs Brewing Company (Harrisburg, PA). The justified his love by taking the bock gold, American stout silver, and German pilsner bronze. Though apparently the Nugget Nectar that Nate loves so much was nowhere to be found. 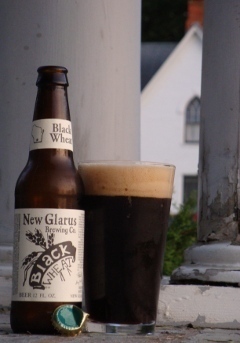 From New Glarus Brewing Company in New Glarus, Wisconsin, I have a bottle of Black Wheat. This weissbier is made with not only the traditional wheat and barley but also roasted malts, oats, and rye. The roasted malts make it dark, the oats make it chewy, and the rye makes it spicy. Black Wheat is a deep dark chocolate color. The tan head is thick, creamy, and long-lasting. This wheat beer has a smooth malty nose with hints of complexity. Toast, wheat, roast, and chocolate malt aromas lead the way, with spices including cloves, cinnamon, nutmeg, and black pepper complimenting the grains. Just a hint of fruit, probably banana. A creamy palate and rich and dry malt flavor greet the tip of your tongue. This beer is an ideal hybrid of English stout and German wheat: robust malt character with coffee and chocolate of a stout, rich wheat flavor and spiciness of a weizen. Toast and coffee with chicory balances the wheat and bread. Cloves, nutmeg, and rye add a new dimension. A slight banana flavor rounds out the taste. This beer is malty but also quite dry with a lively carbonation. An interesting concept, well executed.